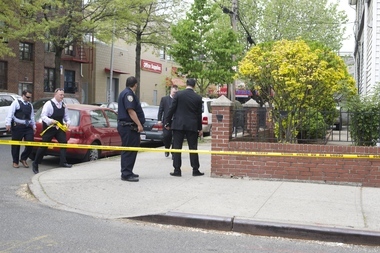 JACKSON HEIGHTS — Two gunmen shot and killed a man in what appears to be a gang-related attack, sparking investigators to shut down part of the neighborhood in a search for the suspects, officials said. The victim, identified as Jorge Manzanarez, 38, of Corona, was in front of 93-12 Roosevelt Ave., near Whitney Avenue, about 2:23 p.m., when he was shot in the torso, an NYPD spokesman said. He was taken to Elmhurst Hospital in critical condition, an FDNY spokesman said. He later died of his injuries, police said. In the wake of the shooting, police cordoned off Roosevelt Avenue between 93rd and 94th streets and Whitney Avenue from Aske Street to 40th Road to allow investigators to canvass the area. Police looked under cars and in backyards for the two suspects while a police helicopter circled overhead. Locals said the shooting and police response made them feel tense. "Everybody who live here, is not safe," said Alfons Matta, 69, who has lived in the area for 10 years, "You have to protect yourself. Close door, go inside. A lot of gangs. You have to stay away." The investigation continued Wednesday, but an NYPD spokesman said it appeared to be a gang-related incident.